Posted on Thu, Feb 21, 2013 : 5:12 a.m.
Tangent Medical, an Ann Arbor-based creator and provider of IV therapy products, was named the Most Innovative Company at the 2013 Business Excellence Awards by ActionCOACH, a business coaching firm sponsoring the award event. 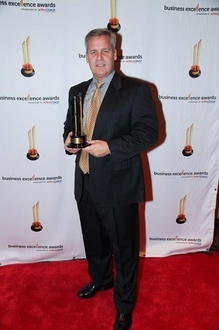 Curtis Bloch, vice president of sales and marketing at Tangent Medical, accepts "Most Innovative Company" award at the 2013 Business Excellence Awards Jan. 25 in Las Vegas. The award was presented Jan. 25 during the Business Excellence Awards ceremony held in Las Vegas. The Business Excellence Awards honor the "best of the best" results in small and medium sized businesses from around the world. Tangent Medical was among more than 400 companies participating in the event this year. Tangent Medical was named in December as a finalist in the Business Excellence Awards as a result of its higher than average scores during preliminary judging for Most Innovative Company, and was named the winner in the category by a panel of independent judges. The award was given to Tangent, in part, because of its development of the NovaCat Integrated IV Catheter System. The product's design was inspired by extensive clinical research into the needs of both healthcare workers and patients, company officials said.